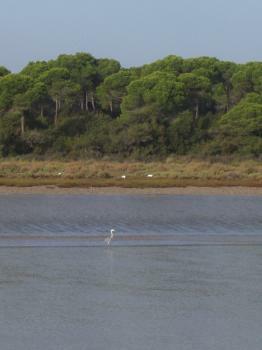 Doñana National Park is a wetland / coastal reserve at the delta of the Guadalquivir River and a major site for migrating birds. The park holds 360 species of birds, in transfer from or to Africa (on the same flyway as Djoudj and Banc d’Arguin). Especially noted are its wintering waterfowl, which number over 500.000. 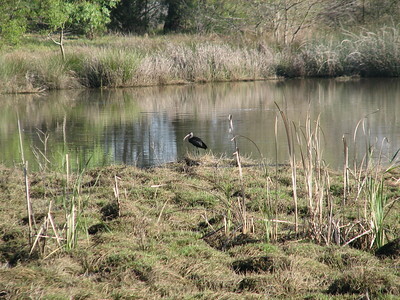 The park also is the habitat of the endangered Spanish lynx, Adalbert’s eagle, marbled teal and white-headed duck. The site was extended in 2005 to include three more bordering areas: West Triangle, Flood plain of the Partido stream and Los Caracoles. Access to Doñana is very restricted: there are a couple of visitor centres at the park’s edges, otherwise you have to join a guided tour. I started my visit at the primary Visitors Centre, in Acebuche. I quickly found out that I would miss out on the guided tours that are conducted daily from here: between Easter and September you have to pre-book a tour well in advance. So I went for a long walk instead, following the wood paved trails that guide you along the best places for birdwatching. I did see a lot of birds that are common in Holland (also on the same flyway) – waterfowl for example. I heard more twittering than I saw species, but that probably is the curse of birding. I stayed overnight in the funky little town of El Rocio, which could easily vy for its own place on the World Heritage List. In El Rocio a yearly pilgrimage takes place in the week before Pentecost. The town is full of houses of the Brotherhoods coming from all over Spain. Sand covers its streets, which has the fortunate side effect that it slows down the cars. In the evenings, locals go for a ride on their horses. This is real cowboy country, more so than the American Southwest which it resembles. More authentic than Santa Fe, and with an even more ‘oasis in the desert’ pilgrimage church than San Xavier del Bac (near Phoenix, Arizona). The next morning I went to the visitor center of La Rocina, just outside El Rocio. It has the same kind of trails as Acebuche, but I liked these even more. Highlight is the ‘Arroyo de la Rocina’, a stream where you can see lots of birds when you’re very silent. Or where you can see and hear lots of birds fly away if they just hear you move. The ibises and the egrets are the easiest to spot, as they are big and not too easily scared. A bit further on the surroundings change into the ‘cotos’, the most characteristic ecosystem of Doñana. It consists of scrubland, with heather and aromatic species such as rosemary and lavender. This area is inhabited by small birds and reptiles and very pleasant to walk in. Both the bees and me enjoyed all the wonderful smells. A few extra points to those made by earlier reviewers about visiting the Donana WHS. a. There are still unanswered “issues” regarding the inscribed boundaries of this WHS which create a problem if you want to ensure that you not only see its “natural environment” but also actually cross into the inscribed area. The 2005 WHC agreed a “Minor boundary modification” which was said to “bring the boundaries of the World Heritage property in line with the extended National Park; thus the total area of the World Heritage property will be 54,251.7 ha”. The following map titled “Boundary as extended by the 29th session of the WHS” (sic) was then lodged with UNESCO. Nb the “shape” of the NW of the Parque around El Rocio – a straight line following the A483 to the coastal developments. b. However, maps of the Parque Nacional (PN) which we saw at visitor centres did not coincide with these boundaries. These 2 examples of maps on the Web are the same as the ones displayed in the PN - first and second. c. The "problem" area is the “panhandle” stretching NW from the La Rocina visitor centre. The UNESCO map doesn’t include it, but the Maps of the PN do! Furthermore, all descriptions of the current area of the PN describe its “Superficie total” (which presumably includes the “panhandle”) as being 54.252 ha i.e the same as the “extended” WHS!!! E.g from the same web site as the first map. How can the WHS have the same total area as the NP, have been extended to have the same boundaries as it and yet not include this “panhandle”? N.b The "panhandle" is clearly described as being a part of the "Parque Nacional" rather than the "Parque Natural" - if it were part of the latter then it could not, of course, be a part of the WHS. c. The “panhandle” area contains nice walking trails (E.g the La Rocina trail described below by David Berlanda. See also.) and you will be able to see much of the bird life you would see inside the main NP area. But do they take you INSIDE the WHS? Depending on how important actually getting inside the WHS boundary is to you, then you could take the “risk” of limiting your visit to the “panhandle” or else look for other means of ensuring that you actually go within the WHS boundary as shown by the “official” UNESCO map! c. Trips inside that “UNESCO Map” inscribed area are only provided by authorised concessionaires in special vehicles - at a cost. But here too you will need to check that any tour you are about to take actually goes inside the “official” WHS - their descriptions can be rather “vague” on the matter. The first 3 sections in the following link are, I think, the only ones which go into that area. I am not sure about the “WHS validity” of the 4th section titled “Other Itineraries”! d. We took the “Itinerary North” provided by the agency “Discovering Donana” departing from El Rocio. It lasted 8 am to noon (Eur 30 pp. It does offer more expensive options for 4 to 6 people in smaller vehicles but there were not enough customers on the day of our visit for any of these to run). Even this only spends a relatively small time inside the “official” WHS. Using the "first" map above. it goes eastward from El Rocio along (but outside!!) the fence of the PN (albeit inside the “Parque Natural”) before turning south through a gate into the PN/WHS (the brown coloured area) for a short distance - when it crosses the boundary fence again and runs along (but outside!!) it all the way to the Jose Antonio Valverde Visitor Centre (VVC. Which is itself situated outside the PN on its boundary). It returns through the PN the same way (but follows slightly different trails in the Parque Natural back to El Rocio). The tracks followed are clearly visible on Google Maps. But n.b - Google shows incorrect boundaries for the PN by including a large area NW of El Rocio which is not included in any of the other maps I have cited above and is, I believe actually in the “Parque Natural”! e. The trip was “ok” - or as “ok” as one inside a noisy “all terrain” bus, viewing through window glass and with some 15- 20 other people can be! 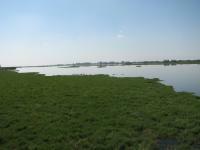 It takes you to 2 types of Donana environment - woodlands and marshes (but not the dunes which are in the south). The guide knew his stuff (and the bird names in Spanish, English, French, German and even Dutch!!). We saw all the birds one would expect plus (thanks to the guide) a few of the smaller, less common, rarities and “specialities” (e.g Marbled Teal). The guide claimed that, just the previous day, the same trip had a “glimpse” of a lynx in the forest area. If you are wanting both to visit inside the WHS AND birdwatch I would suggest taking it (or similar) to get a feel for the NP and its wildlife and then “doing your own thing” outside the WHS parts of the NP on walks or by car on another day (We only gave Donana a morning, plus an evening and a few midday hours in the town of El Rocio which was particularly interesting as pilgrims with horses, caravans, traditional musicians etc etc were beginning to congregate for the Romeria later in the week). f. The VVC IS reachable by car on dirt tracks from the north (E.g Villa Manrique de la Condesa) - it has a car park for such visitors so, in the dry at least, it should be ok. You could walk/drive (albeit outside the PN) and get into the “Marisma” area. g. An aspect which intrigued us is the almost total absence of any recognition given to the site’s “UNESCO WHS” status when you are actually there! The boundary of the WHS goes right up to the “promenade” in El Rocio overlooking a lake – an ideal place one might have thought for a plaque. But there is nothing. And when you cross from the “Parque Natural” to the “Parque Nacional” again nothing - albeit that there are other signs at the crossing which could have shown a logo etc! Inside the VVC there are plenty of notices festooned with the Parque’s other “memberships” (Ramsar etc) but I found only 1 showing the UNESCO logo. Our guide said that there used to be a plaque and even a certificate on the wall but he didn’t know why or when they were moved - and neither did the VVC attendant. Perhaps they have been moved to one of the other visitor centres? As reported elsewhere, this is a difficult site to access. I reached the entry point at La Rocina by bus from Seville via the sand dunes of Matalascanes. From this entry I follwed the boardwalks to hides along the Madre de las Marismas. I returned from El Rocio to Seville via Almonte, but another time I would avoid the summer weekends when the buses are full of people going to the beach. We visited on a boat trip from Sanluca de Barameda, (I think this now means that all the main routes into the park are covered in reviews here) it was an enjoyable trip that gave a good over view of the importance of the park. It landed once in the National Park (WHS) for an hour tour and it landed once in the Natural Park (WHS buffer zone) for a spot of bird watching. Like I said I enjoyed the day out but I could only really guess at the importance of the site. From the various hides in the national park we only managed to see one horse and a deer from a great distance. I guess that this is what is normal for visiting wildlife destinations, being brought up on David Attenborough documentaries you sometimes get spoilt and assume you will see the main attractions every time. 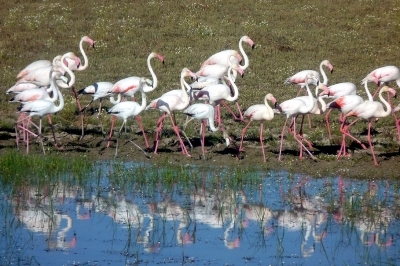 In the natural park we managed to see quite a variety of birds: Herons, Spoonbills and Flamingos. This was nice although ornithology would not be one of my big passions so I perhaps didn’t get the most out of it. The boat trip lasted about 3.5 hours and cost €17 (2008), it runs from the Donana Visitors centre in Sanluca which has some interesting exhibits on the park as well as some on the local sea faring traditions, Columbus and Magellan both set sail from here. Sanluca is also famous for its seafood and Manzanilla wine, though the town itself was nothing particularly special. This was an enjoyable trip, mostly for the boat journey along the river. I am sure that the National Park is of great significance and is a key spot for many animals especially birds. In our travel around Spain we have been to the National Park of Doñana, situated on the right bank of the river Guadalquivir at its estuary in the Atlantic Ocean, important above all for its population of birds, with 5 endangered species. It is also one of the largest heronries in the Mediterranean region and the most important wintering site in Spain for waterfowl. The first thing to say is that if you want to enjoy fully your visit to the park, you have to book one of the guided tours, starting generally from the Visitor Centre of Acebuche (the most important of the five), with which organized companies bring you with a bus to explore the inner parts of the park and to watch birds. There is one tour of the northern part of the park and one of the southern; there is also a boat trip on the Guadalquivir from Sanlúcar de Barrameda that shows you the right bank of the river, included in the park, staying outside of it. But we couldn’t do that because we didn’t know before our travel in Spain in which date we could arrive to the national park, because our itinerary wasn’t based on precise time planning. If you want to visit places similar to those included in the National Park, you might visit the Natural Park (it surrounds the National Park in 4 sections and acts as a kind of Buffer Zone) that has 2 Visitor Centres and 7 Trails and you can access it without problems; however it is not part of the WHS, so it isn’t the best thing to do for WHS collectors. The main problem in visiting this WHS is that it is entirely surrounded by a fence (situated exactly on the boundary of the WHS) and it is forbidden to go inside the park because of the protection of animals living there. Only one small traffic road runs inside it going to a place called Palacio de Doñana, but it is closed. If you haven’t booked a guided tour you can view the WHS only from Sanlúcar de Barrameda, a town situated on the left bank of the Guadalquivir, and from the road A 483, that starts in Almonte (in the municipality of which the western part of the park is located), running along the western border of the park. We chose this road and first went to El Rocío, a small vernacular village with a nice sanctuary situated on the north-western boundary of the park, from which, staying outside of it on some terraces arranged along a path (looking a little bit like a lakeside), you can see one of the marshes (or salty lagoons) of the park. It is quite a pleasant walk and the only place from which you can see a marsh on your own, although it is not the best way to watch birds. A very picturesque image is that of horses grazing on small “islands” surrounded by water. From El Rocío you can also have a walk along two of the only four paths that let you go inside the park: the Raya Real Trail, 15 km long, of which 6 in the WHS along its northern border and 9 in the Natural Park, and the La Rocina Trail, 12 km long running in the narrow strip (that isn’t included in the WHS) of the National Park comprising the stream La Rocina. However we decided not to do this trails because of the lack of time. After the visit to El Rocío we continued with our car along the western border of the park and its fence. From here you can see on your left the typical and very particular vegetation of the park consisting of scrub woodland and maquis. Finally we arrived to Matalascañas, a coastal resort full of modern buildings, even very big hotels, and of people going to the sea; this modern scenery certainly damages the authenticity of the park because the buildings are situated only few meters from the fence of the park. In the middle of this village, outside the National Park, there is a Dunes Park, in which you can walk on some paths. However, it is much better to go to the eastern end of the village, where are the other two paths going inside the park: the Dunes Trail, a short walk 1,5 km long, with much more authentic fixed (stabilized by vegetation) and mobile dunes, and the Beach Trail, running along the southern coastal border of the park for 32 km. We have been at the beginning of the two routes: it is a pleasant walk. My review of the can sound a little bit complicated, so if you want to know more, go the web pages http://www.discoveringdonana.com/Doñana.htm. However this is really the complicated situation you will find if you would like to visit the park. I quite liked the National Park because of its variety of biotopes but certainly with the guided tours our visit could have been better and however there are not really spectacular natural features. It doesn’t deserve a long travel specifically to visit it but if you are in Andalusia it is really worthy to be visited, especially with the tours. I can’t say if the Park deserves its inscription on the WHL because I haven’t visited the inner parts of it, but they are certainly beautiful. However I think that the National Park and also the WHS could be larger and include also the Natural Park, that is similar. In the photo you can see the marshes viewed from the terraces of the village El Rocío. 5.0: Alexander Lehmann Antonio J. 2.5: Daniel Chazad Ralf Regele Nolan B. Named after individual people: The name of this land is consolidated a century later, with the construction by the seventh Duke of Medina Sidonia a palace for his wife, Dona Ana Gomez de Mendoza y Silva, in the heart of the mountain. The surrounding land soon begin to be known as the Forest of Dona Ana, Dona Ana Coto, etc. Until finally the name was shortened to know today.